my mom loves coffee; she drinks it all the time, even late at night before bed. i have this really distinct memory of being four years old, and us drinking from matching coffee cups. in hers — folgers. in mine — pickle juice. i guess the point of that, is there’s a special place in my heart for pickles. a couple weeks ago, steven and i took a day trip to the new river gorge in west virginia to go zip lining. it was a lot of fun and it’s so beautiful there, but in true chef fashion i think he was most concerned with what we’d be having for lunch. after much googling and pressure from a control freak friend (hi, bill!) we settled on gumbos cajun restaurant. i had a fried crawfish po’ boy with the most delicious pickled okra on the side! i mean, this okra seriously tasted like a dill pickle. i ate mine and his. i guess it may be a no brainer to some people, but it was an epiphany to me: you can pickle anything. 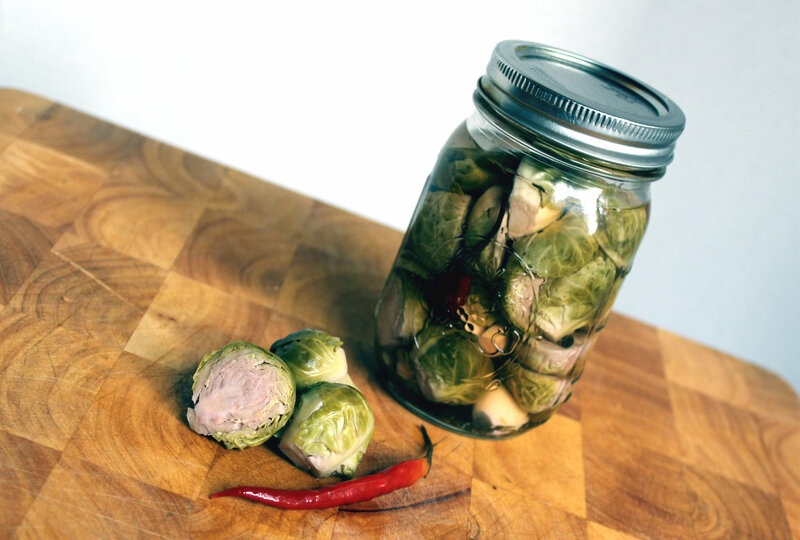 i didn’t believe him at first, but trust me… these pickled brussels are worth the wait! they’re also pretty fun to make. 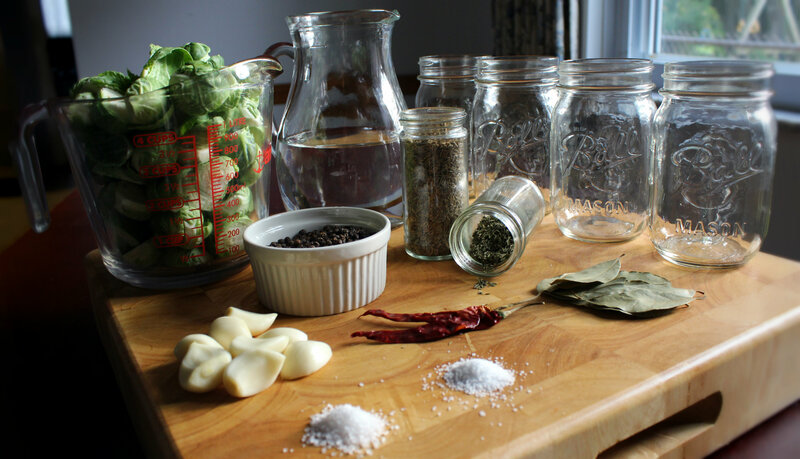 the amount of ingredients vary depending on how many jars you want to make. 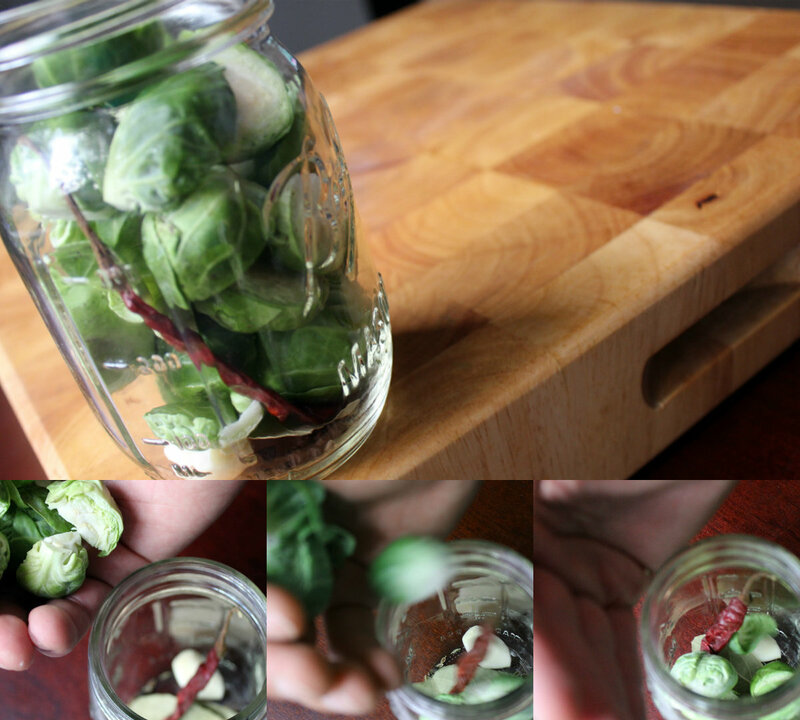 fill the jars up the rest of the way with the brussels. now, we can these bad boys! put the lids on the jars and put the jars in a pot of boiling water. make sure your hands are as clean as possible — you don’t want to can germs. let the jars boil for at least 10 minutes. for the final step, we’ll borrow a line from tom petty, “the waiting is the hardest part.” maybe he was pickling brussels, too! wait a week or two, and voilà! That looks divine! Stupid question because I’ve never canned. So, you just boil those jars? Do you not need a lid on top of the pot in which you are boiling? See, I should have paid attention to my grandmother when she was canning, but I seem to remember that her “canner” was a big pot with a lid that for some reason I thought could blow the roof off at any moment. 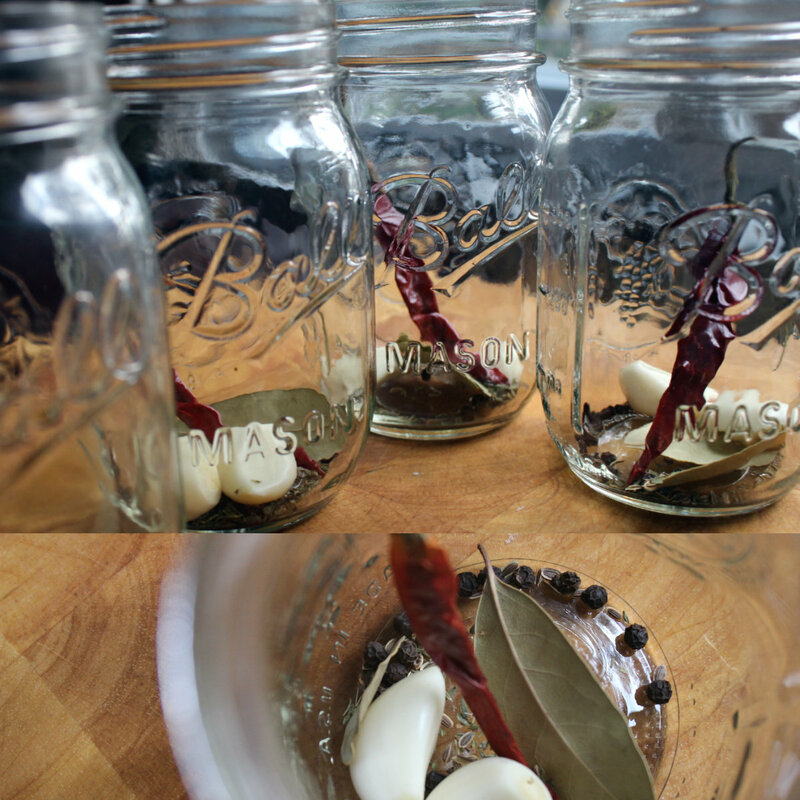 Probably why I avoided canning – not fond of explosions! Let me get this straight: the jars are totally submerged in the boiling water, is that right? Also, where do I find chilis de arbol? 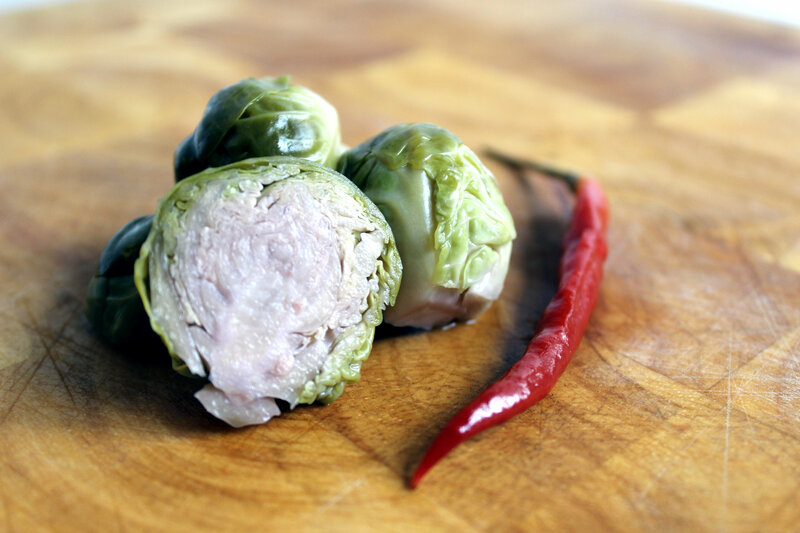 I love pickled brussels sprouts, so I definitely want to try this.Great to see you guys today. jars are totally submerged. chilis de arbol is pretentious steven speak for whatever kind of dried hot peppers you have/can find at the grocery; but i’d bet they have them at gucci kroger. you know what: upon reflection (and a quick google search) the jar does not have to be submerged. 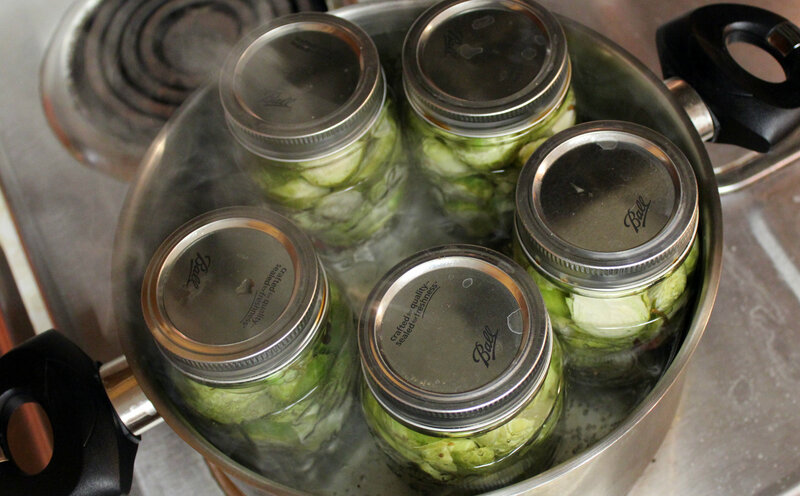 the huge pot we usually use for canning does submerge mason jars, but clearly the one in the pictures up there didn’t. i can’t remember; but i think we used that specific pot just for the picture. anyway: you should be good if you get the water to the shoulder of the jar.